Jack Baldwin (left) and Steve Taylor have both been told they can leave Posh. Peterborough United manager Steve Evans says his preferred playing style and club transfer policy dictated his retained player list. Eyebrows were raised at the presence of popular centre-back Steven Taylor on the transfer list. He was one of 13 contracted players made available for transfer by Evans yesterday (May 6). Posh midfielder Anthony Grant could leave the club this summer. Other listed players included first-team squad regulars Chris Forrester, club captain Jack Baldwin, midfielders Michael Doughty and Anthony Grant, and striker Junior Morias. Teenage midfielder Leo Da Silva Lopes was among those retained by Posh. Evans intends to play a dynamic 4-4-2 formation next season as Posh attempt to get out of League One and return to the Championship for the first time since the 2012-13 campaign. It’s club policy to place players entering the final year of their contracts on the transfer list if they don’t agree an extension. Talks have already started with key men Gwion Edwards and Ryan Tafazolli who both fall into that category, but Posh were reluctant to offer new deals to players already over 30 like Taylor and Grant. Posh have retained January signing Joe Ward. “Steven Taylor has behaved impeccably in my time at the club,” Evans stated. “But he wants the security of another two-year deal and we don’t like giving players over 30 that sort of contract. It’s club policy to place players on the transfer list when they enter the last year of their contract. “My relationship with Steven is very strong. I was honest with him and told him he might not be best suited to the way I want to play. He can get by in a two-man central defence, but maybe a three-man defence suits him better now. He doesn’t want to get dragged out into wide areas where pace becomes a problem. “Sometimes Steven has suffered because of the form of others. Jack Baldwin is a great lad and a great captain, but he hasn’t had a good season so it’s time for him to move on. Ryan Tafazolli is my main man at the back. “Ideally next season I want to play with two strikers. I wanted to do that this season, but I didn’t have anyone good enough to play alongside Jack Marriott. I want a two-man midfield with one tenacious tackling sort who can get around the pitch like Richie Smallwood did for me at Rotherham. I want one alongside side with great mobility, a younger Lee Frecklington if you like. “That’s my problem with Anthony Grant who is another top professional, but one who is better suited to being one of three midfielders. If I was going to play that way I would pick Anthony every time. “I’m keeping Leo based on his potential. I had a good chat with him yesterday. He told me he’d been coached to keep possession at all costs which is fine, but I need my midfielders to take chances and get from box to box and contribute goals. Leo might only have played 10 games at other clubs rather than the 100 he’s played for Posh. For him to start in my team next season he needs to show me a bit more. “Putting Chris Forrester on the list is really disappointing. He’s a player I watched rip West Brom apart in the FA Cup alongside Martin Samuelsen and I felt then he was going to be a top, top player, but he’s struggled for form for a long time now. “I kept picking him when I got here, but Chris admitted he was poor in every game for me. 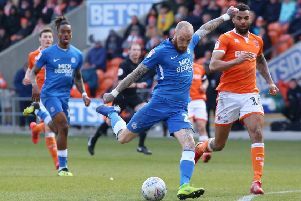 Evans, who flies out for a four-day summit with the Posh co-owners tomorrow (May 8), insists many Posh transfer targets have already been identified and passed to director of football Barry Fry to open negotiations. - Where did it all go wrong for Peterborough United?